Lock in a great price for Esperas - rated 9 by recent guests. Staff was super friendly and accommodative. They let us store our bags in another room and shower after a boat tour. We were already check out of our room but this was a nice plus. Location. Staff (particularly wait/bar staff) were friendly and accommodating. Amenities; pool was lovely. Sunset views. Breakfast was great! Amazing - out of this world - view. Great location. Super friendly staff. The staff was incredible! And the views were breathtaking! Highly recommend this hotel. We will be back! Gracias Esperas!! The room was adorable. The full breakfast delivered on time to room was a treat. the location facing the sunset every night was stunning. The pool was wonderful. The pool bar served and meals great! So close to town but such a secret quiet location! The staff was amazing! The moment they greeted us they went above and beyond! Loved all of their recommendations and they were super attentive. We also loved the breakfast in our room. The location is perfect for sunset so you don't have to fight the crowds to watch the magical sunset. We couldn't watch the sunset from our terrace but enjoyed it none the less from the hotel bar. We did have a wonderful view overlooking the water though. It's away from the hustle and bustle of central Oia which we liked but very close enough to walk. Staff were extremely friendly and helpful and assured in transport around the island and recommended tours, restaurants and places to visit. 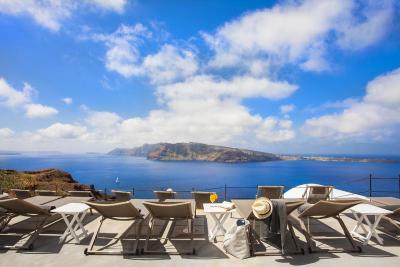 Perched on a cliff, opposite the volcano and the islets, Esperas in Oia boasts a carved-into-the-rock pool, and offers accommodation with unrivalled views of the Aegean Sea. 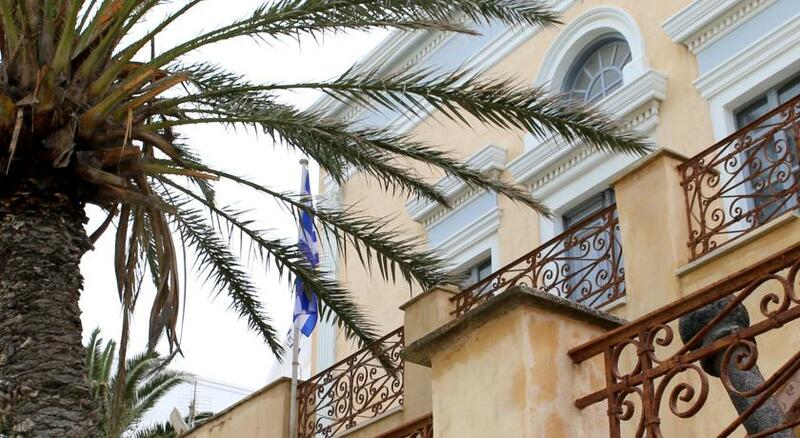 The tasteful, Cycladic-style units are air-conditioned and feature comfortable Entos mattresses and Greek bio & Zealots of Nature bathroom amenities. Modern installations include free Wi-Fi, satellite TV and DVD/MP3 player with a DVD collection. 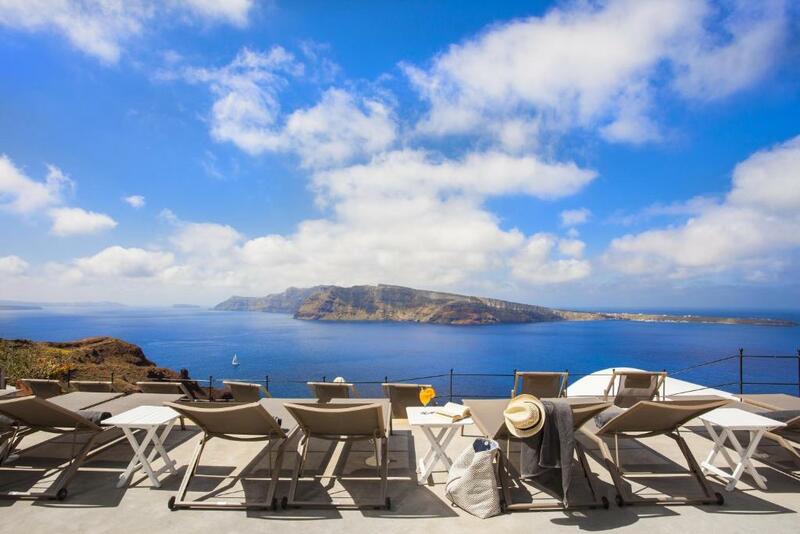 Guests at Esperas can take a dip at the pool and enjoy the stunning view over the caldera. The pool-side bar offers refreshing drinks and snacks. Lunch and dinner are served at the on-site restaurant. Water sports such as canoeing and jet skiing can be arranged at the reception, while horse riding is also available. Transfer from and to the port or the airport is available upon request. This is our guests' favourite part of Oia, according to independent reviews. Esperas has been welcoming Booking.com guests since 3 Mar 2011. When would you like to stay at Esperas? Traditionally decorated, junior suites provide 2 separate bedrooms and 2 separate bathrooms and features a spa bath. They enjoy a sea view from their own private veranda, offer a dining area, a satellite TV and a DVD player. Bedding is by Entos and toiletries are by Greek bio & Zealots of Nature. Very spacious, tastefully decorated suite with hot tub overlooking the sea. Consists of a spacious seating and dining area, 2 bathrooms and 2 separate bedrooms with bedding by Entos and pillow selection. One of the bedrooms is on a loft, separated by stairs, without a door. An extra loft with single bed is also available. Bathrooms feature Greek bio & Zealots of Nature amenities and Coco-Mat towels. Features a satellite TV, and a DVD player. Traditionally decorated apartment with unique decoration and set-up, it overlooks the sea from its private veranda. Offers a satellite TV and a DVD player. The bedroom features a two-pillow selection by Coco-Mat. The bathrooms feature Greek bio & Zealots of Nature amenities, a hairdryer and Coco-Mat cotton towels. With unique decoration and set-up, this studio has a private veranda overlooking the Caldera and offers unobstructed sea views. It includes a satellite TV and a DVD player. Bedding is by Entos. All studios have Greek bio & Zealots of Nature toiletries, a hairdryer and Coco-Mat towels. Slippers are also provided. Please note that this studio cannot accommodate an extra bed. Featuring two verandas with sea and sunset view, the suite offers a private outdoor hot tub. The bedroom features Entos bedding and a two-pillow selection. The living/sitting room includes a satellite TV and DVD player. The bathroom features Apivita toiletries, hairdryer and Coco-Mat cotton towels. This traditionally decorated Suite consists of a large sitting and dining area, two separate bathrooms and two completely separate bedrooms featuring bedding made from all-natural materials and a two pillow selection all by Coco-mat. The Superior Suite enjoys a sea and sunset view from its private veranda, while it offers a minibar, coffee and tea-making facilities, as well as satellite TV, a DVD player and a safe. 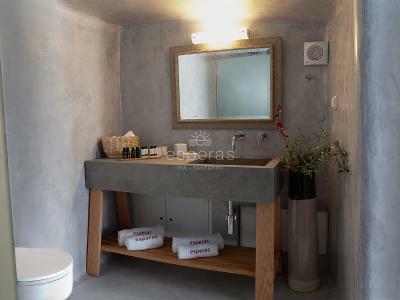 The bathrooms all feature Greek bio & Zealots of Nature amenities, a hairdryer and soft cotton towels also by coco-mat. -Greek bio & Zealots of Nature bathroom amenities, slippers and COCO-MAT towels. This suite has a balcony, hot tub and seating area. House rules Esperas takes special requests - add in the next step! All further adults are charged EUR 150 per night for extra beds. Esperas accepts these cards and reserves the right to temporarily hold an amount prior to arrival. Since the Esperas is well-known as a special retreat for couples looking for serenity and romance and due to the fact that the hotel is located at the caldera (on the cliff), children under the age of 12 are not allowed. Please note that photos are indicative of room type interior. Please let Esperas know your expected arrival time in advance. You can use the Special Requests box when booking or contact the property. I loved the charm of my cave house room, but when the doors were shut at night the air was a a little musty—not great for allergies. The bathroom fixtures too are suffering from salt air. Also, guests should anticipate the daily stairmaster hike to the car park or into Oia. It’s great exercise and fun to be up among the windmills, but wending your way home after a couple of glasses of wine at night might be dizzying! The staff at Esperas are unbelievably warm, helpful & generous! And the caldera views are off the charts. Every sunrise & sunset was a surprise. It’s also nice to be a little distant from the invasions of the cruise-ship crowds. My room was serenely beautiful—charmingly furnished with antiques and bright white linens. Complimentary breakfast on the terrace was a bit of heaven. The rooms are very bare and not as comfortable as a newer hotel. That is because it’s on the side of a cliff! Our stay at Esperas was absolutely perfect! The location is quiet and serene compared to staying closer to the center; however, there are plenty of restaurants and shops within walking distance. The staff and the accomodations were beyond our expectations. The staff was very accomodating and provided us with great recommendations on places to see and eat! Esperas and the staff there were the best part of our trip in Greece! 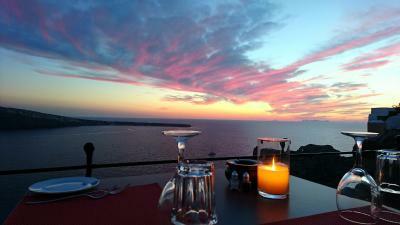 I would recommend this location to all others traveling to Santorini! Stayed in the sea view villa; single bed room had a very firm mattress, no AC and no Wi-Fi access. Also, plunge pool steps were very slippery and had a fall on the first day. Great view, good bar staff, great room service breakfast overlooking scenic view. This review refers only to the 'studio with sea view' room which we had. The room was very small, the bed was very uncomfortable and positioned very high which added some difficulty to climb on the bed. We mentioned that the bed was very uncomfortable and the stuff helped us quickly and fixed the gap that was on the bed and as gesture of kindness brought some fruits to the room. The fix helped for a couple of days, however last night in the hotel was a very bad experience and the problem with the bed back again. The room wasn’t feel clean and the bathroom wasn’t comfortable either. Same goes for breakfast that wasn't fresh and didn't meet our expectation. The view of the hotel is breath taking. The hotel is on the cliff. And some of the rooms are curved into the rock. The staff are great! And the service is excellent. Not great value for money. Restaurant -very expensive. Very small portion. Very unimaginative and not great quality. Ate in restaurant once then ate in town instead. Good service. Amazing view. Small sea view room. Vicky at front desk not helpful and rude at times. Better variety of breakfast would be nice. Expensive for the room. Great location and view. Nikol at the front desk was awesome! For the price (high), I would have expected a bit higher level of service. For example, a welcome drink/cocktail, some "surprise" in the room, check-in by the manager during the stay, etc. Going the extra mile kind of stuff. Hmmm, that’s a tough one! Had a love/hate relationship with all the steep steps...BUT that is also what makes Esperas so special! Toss up between location and friendly staff! The location is perfectly situated for access to the small fishing port below, the busy shopping and restaurants above and for sunset viewing. Five of us comfortably stayed in a two bedroom cave suite which also had a jacuzzi and kitchen. Loved having breakfast delivered each morning by one of the staff who we really enjoyed getting to know. Kevin, Geoffrey, and Keisey were always there to serve us with a big smile and friendly conversation. At the desk, Vicky and Nicole were also helpful with suggestions and arrangements for dining and rental cars. So glad we arranged for hotel staff to transport us to and from the ferry port as they were prompt and were excellent drivers on the narrow winding drive! We enjoyed relaxing by the pool with refreshing beverages in the afternoon and tasty shared plates and wine while experiencing the beautiful sunsets. This place is terrific! .... the views. A very special place. the breakfast delivered to your room is a wonderful bonus that made it so special and relaxed. They literally have the BEST sunset location of the entire island! So incredibly happy we stayed here.